Ok so let’s start from the bottom up! Firstly add your liquid, I prefer unsweetened plant-based milk like Coconut, Almond, Rice, Hemp. The list is pretty endless. You can also use Diary based Milk, Coconut Water or Filtered Water. Superfoods are a great way to get an extra boost of nutrients that are generally easy to digest. There are so many to choose from depending on where your body might need a little extra love. Think things like Goji Berries, Cocao Powder, Spirulina/Greens Powder, Turmeric, Cinnamon, Ginger, Maca Powder, Probiotics… plus so many more! Again you can go as bold or if you are starting out, I recommend starting small. Alkalising greens are great to add to assist your body to detoxify and cleanse, like Cucumber, Spinach, Kale, Parsley, Mint. I like to even add Zucchini’s to my smoothies as they give it a smooth creamy texture without changing the taste – WIN WIN! It’s really important not to be afraid of good fats. We grew up thinking they were bad for us and now it is constantly being proven that in fact they are great for our bodies and a necessity. Adding fats or a Nut Butter to your smoothie will keep you fuller for longer and help with those cravings. Some great’s things to add are Coconut Oil, Avocado, Flax Seeds and Chia Seeds (also great for Omega 3). Nut Butters are so yummy, I seriously can’t live without them now, from Almond Butter, Hazelnut Butter (seriously this is Nutella!) Cashew Butter etc. 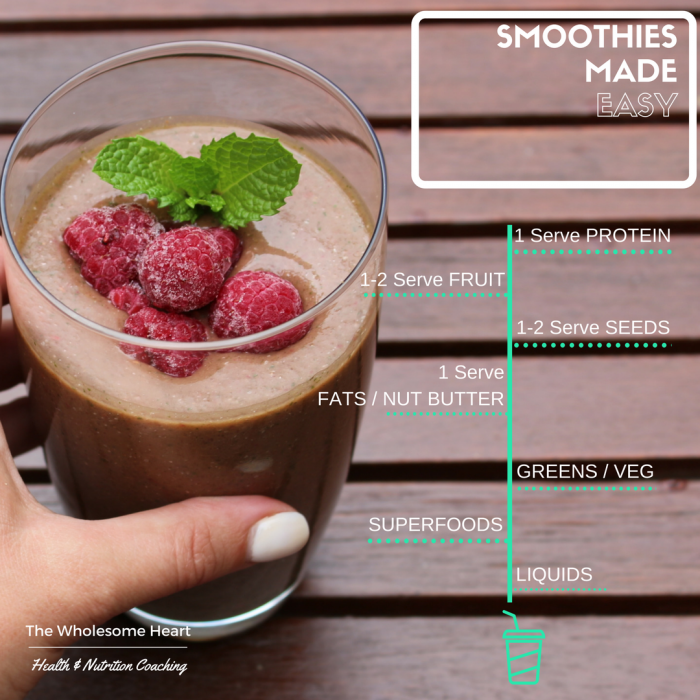 You might think all of these things will make a gross smoothie, my idea is to make them as yummy as possible (with hidden benefits) I don’t want you to have to hold your nose and chug it down – just because its ‘healthy’ NO THANKS! I wouldn’t even do that. Taste is so important. However our tastebuds have become accustomed to sugars and sweeteners, so we need to train it to like foods without all the added junk. I recommend 1-2 servings of fruit, like a Banana, Green Apple, Grapefruit, Limes, Lemon, Berries or even Dates. You are looking for Low GI fruits that can be easily digested and slow release. You don’t want a spike and crash! Protein Powders are great, but it important to pick one that does not contain, sugars, artificial sweeteners, additives, and artificial flavours. Personally I prefer either plant-based or organic whey protein using only natural ingredients. Research some and see what works best for you. Other sources of protein include, Nuts, Hemp Seeds, Spinach, Yoghurt, or if you are game… a raw organic egg! So have a go, try different flavours, superfoods, proteins, and see what you like! There are so many creations you can come up with! Let me know what you come up with! I am always looking for new creations. Check out some Smoothie Creations! Click for ALL Smoothie Recipes! Search The Wholesome Heart Site!